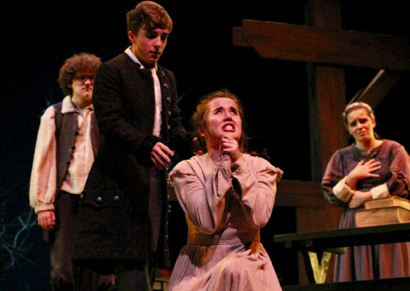 M-A drama’s production of The Crucible by Arthur Miller begins on a grim stage, with a plain wooden cross in the center and backlit, bare trees for effect. After a season of dedicated hard work, directed by drama and stagecraft teacher Danette Bathauer, opening night was Friday, October 27th. Performances continue this weekend at the Menlo-Atherton Performing Arts Center: Friday, Nov. 3 at 7:30 pm, Saturday, Nov. 4 at 7:30 pm and Sunday, Nov. 5 a5 2:00 pm. General admission is $12 and student admission is $8. Tickets are available online or at the door. The Crucible is full of haunting emotion, devastating sorrow, and sends a delightful chill through the audience. The plot begins with Reverend Parris (Louis Leon) spotting a group of girls, along with slave Tituba (Sara Madsen), dancing in the forest one night, allegedly conjuring spirits. When one of the girls, Betty (Sophie Glinder) falls ill, rumors of witchcraft begin to spark. Local farmer John Proctor (Ian Peterson), known to dislike Reverend Parris, rejects his past feelings for Betty’s cousin Abigail (Kate Mulhern) and denies the witchcraft. When Abigail accuses John Proctor’s wife Elizabeth (Izzie Nada), things begin to get out of hand. Reverend John Hale (Milo Brosamer) and Rebecca Nurse (Kelley McCutcheon) do their best to calm the hysterical townspeople, but to no avail. Evident from the beginning, truth and lies dance together on a bloody stage, until Mary Warren lies writhing upon the ground, in tears, and nobody is sure of which side they stand on anymore The first act concludes with dreadful suspense, and for many, the intermission can’t finish fast enough. John convinces servant Mary Warren (Zoe Schacter-Brodie) to speak against the dancing and conjuring of spirits. However, Mary breaks and confesses to witchcraft after Abigail and the others pretend that she is bewitching them. Now it is John who must testify – confessing prevents death by hanging, but only if he admits to lying. Not confessing leads to painful death by noose, but pride in how he leaves the earth. The tension heightens – people are in jail left and right, accusing others, being accused, providing false evidence, withholding true evidence. “I say God is dead,” says John, infuriating Deputy-Governor Danforth (Dmitry Goltsev), who rules over the court proceedings. After consulting with Elizabeth in a tear-wrenching moment, John decides he wants his freedom and falsely confesses to witchcraft. However, he cannot bear the thought of the whole town seeing his signature upon the page and tears it up at the last moment. The curtain comes down upon stunned silence, and a cast of jailed characters is ready to meet the gallows. Then, a monstrous applause erupts and does not quiet down for some time. Izzie Nada has been acting since the age of four and plans to continue professionally. She plays Elizabeth Proctor, who, according to her husband, can “never tell a lie.” Nada nobly stands upon the stage and, though in a desperate situation, retains herself and her pride with dignity. “Elizabeth expects the people around her to adhere to her moral code. I don’t really have that expectation for other people,” says Nada. “But I really admire her strength and her way of sticking to her values. I think that’s how we’re similar. “It’s heart-wrenching but also hopeful… every character is so beautifully developed and complex. Some of the themes of community and ‘us versus them’ are still relevant, even if it’s a story written about a time hundreds of years in the past.” says Nada. This is an abridged version of an article that appeared on MAChronicle; used with permission.